So likewise do the multitudes of bloggers and websites and reporters that seek to blacken the Prophet’s name and life’s work. When the bookstore owner soon followed the old man into the next life, it gave me further cause to ponder and consider their fate as spoken of in the scriptures: “But unto the wicked he did not go, and among the ungodly and the unrepentant who had defiled themselves while in the flesh, his voice was not raised; Neither did the rebellious who rejected the testimonies and the warnings of the ancient prophets behold his presence, nor look upon his face. Where these were, darkness reigned” (D&C 138:20-22; section 19 is even more cautionary). When my time nears I hope to be acting wiser as I prepare to meet my Maker. 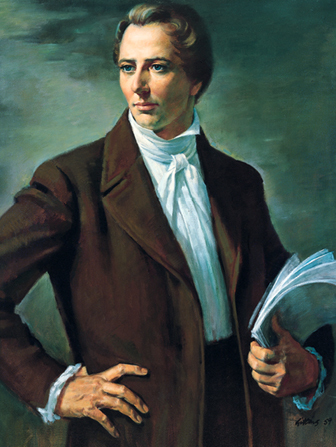 Before I go I want to be doing like Elder Bruce R. McConkie did, and so many others have, testifying of the living reality of Jesus Christ as the Son of God and the Savior of the World, and of the divine mission of the Prophet Joseph Smith. One of my pleasant memories of a visit to President Woodruff’s farm home in Waterloo Ward after I had moved to Idaho, was on an occasion when I took with me a lawyer gentleman from Northern Idaho, who with myself was attending the TransMississippi Congress in Ogden. I told Bro. Woodruff how this man David Franklin Mahana by name had defended the Latter Day Saints in the Idaho Legislature, from verbal assaults made upon them by bitter Anti-Mormons. Bro. Woodruff was sick in bed at the time, but when I made those remarks he rose up in bed and said in a most positive manner: “The Lord will bless any man who will defend the Latter Day Saints against the attacks of their enemies.” I knew the later history of this man David F. Mahana who was indeed blessed as predicted by Brother Woodruff. (Matthias F. Cowley, at University of Chicago, October 4, 1925, LDS Church History Library, MS F 559). Not a few of these snipers delight to take a shot at Joseph Smith. In some surprising way it has become somewhat popular, stimulated, I presume, by books which have been written for students and scholars, to undertake exhaustive research into the life of this great man. In some instances, perhaps, the purpose of the research projects may be laudable, to exploit the great and noble things in the life and works of the Prophet, but in all too many instances I fear the purpose of the research is merely exploratory, with the hope of discovering something that would make for sensational reading and perhaps a profit for the writer. I have never been able to discover any very substantial reason for these researches other than that I have just mentioned. Here is a life recently lived. Many of us here in this assembly today have known and talked with persons who knew the Prophet, and yet you would think from the way the researchers go after him that he was a person of great antiquity, and that something in the nature of excavation for prehistoric materials had to be undertaken to discover the facts of his life. I doubt if there is a person who has lived in the last two centuries whose life is more fully documented than that of this man, unless perchance it be among royalty or those in high public office. Almost every important event in his life has been recorded by himself, by his mother, and by those who immediately knew him. His life is not a mystery; it is an open book, at least to members of the Church who have access to the knowledge which he brought to the world. Because of a family-friend connection, I knew some things about this man and why he had chosen to do as he did with his life. He has earned his reward and will receive it.